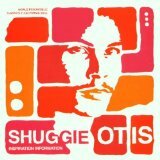 Descending onto the Jazz Café stage from the steep stairway above, tall, slender and well groomed, in a black velvet coat, black pants and high boots, Shuggie Otis exudes superstar charisma. However, when he strikes the first chords on his blood red guitar and nothing comes out of his amp, nervousness washes over him. His raspberry coloured shades come off. ‘Soundman, can I have some help please? I can’t work this thing’. He apologises for the delay. ‘Take your time, Otis, we love you’ a voice in the crowd reassures, applause backs her up. It takes a few minutes for the soundman to bring the amp back to life. When Otis and the band then explode into ‘Inspiration Information’ it is to the relief of everyone. Minor mishaps and musical mastery are tonight’s themes. There are gorgeous renditions of ‘Aht Uh Mi Hed’ and ‘Island Letter’ amongst others. In particular, drummer Marvin ‘Smitty’ Smith and keyboardist Nick Smith show why they are in such high demand. Otis himself is still a virtuoso, performing timeless songs with magnificent fluidity and beauty. Yet he grimaces during his solos, shoots nervous glances at the band and he often avoids eye contact with the crowd. Midway through he needs a chair. The band exits the stage and the air of nervousness returns. Three or four minutes later, Nick Smith can hardly watch the chair being lifted over his Kurzweil keyboards. Otis needs to ‘read these notes, musical notes’. Sitting by himself to perform these new blues numbers, this feels more like a rehearsal. Crowd members ask each other if that sustained buzzing is a sound effect or another technical hitch. The second half runs much smoother. More new tracks are performed and with the band back on stage Otis plays more confidently. Many musicians reach a creative nadir such a long time after their debut, yet these new tracks are muscular, sensual and memorable. The old classics ‘Ice Cold Day Dream’ and ‘Strawberry Letter 23’ have the crowd in raptures. Whilst Otis plays the latter’s swift, complex chords admirably, his facial expression suggests he wonders why he choose to make them so difficult to replay. On record Otis comes across as an enigmatic genius. Tonight he is an endearing paradox. He has superstar charisma alongside crippling awkwardness. His music is lovely yet he appears in pain when performing it. He’s the musical master who can’t work his amp. Take your time, Otis, we love you.